Another offseason, more of the same from Carson Wentz. The Eagles' franchise quarterback reported to offseason workouts along with his Eagles teammates and gave the media an update on where he is health-wise after his mid-season back injury in 2018. And his knee surgery in 2017. And while the always optimistic quarterback was, once again, in good spirits, he wouldn't entirely set aside concerns that he is fully healthy heading into OTAs, minicamp and then training camp. 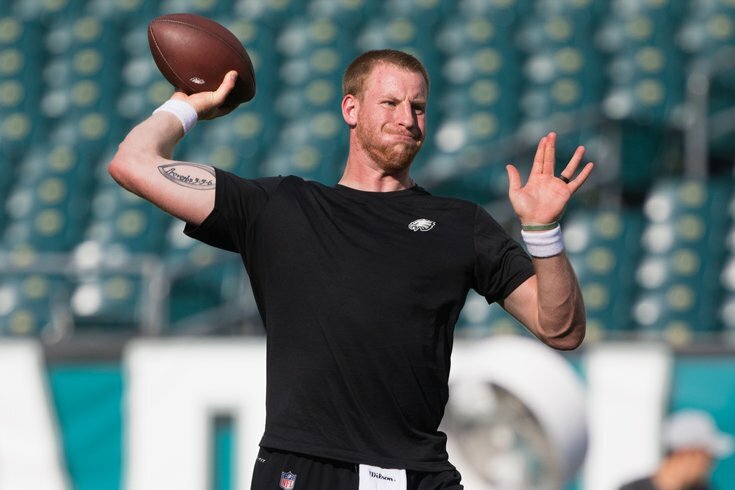 "Knee injuries and rehab is aggressive and it's not fun for anybody," Wentz said. "This back injury obviously is not fun either, but it's a different thing. The life whirlwind is a little different as well. I feel good with where I'm at... it feels like the first day of school today." Wentz said that he is "feeling good," but that he and his team are "kind of taking it week by week." "I am throwing some, running some and I feel good," he added. "There's really no time table, no rush. I feel good with the progression." All of these designations are perfectly fine for April. But over most the last three offseasons, Wentz's lingering injuries have limited his practice time and it has shown on the field during the regular season. His rich history of injury has him earning a reputation as being "prone" to such problems — a label he is very much eager to delete from his profile. "I get it," he said. "I am looking forward to putting those behind me. This league is a physical league and some of those things are out of my control." In addition to getting and staying healthy, Wentz has a lot of other things to worry about this offseason, chief among them signing what is expected to be a monster contract extension. Wentz wouldn't directly confirm that negotiations were taking place, but in two years Wentz will be a free agent, and he did tell reporters he feels that "it's exciting, the idea of being here long term. I love it here. I love the city. I love the fans here." With new best friend Bryce Harper here long term, Wentz signing a big extension seems to be the next logical step as the city locks down its superstar athletes. The quarterback also plans to hold another "retreat" somewhere this summer with his wide receivers and tight ends as he has in each of his seasons with the Eagles. "We have talked about it, we are trying to get those details dialed in."